Wyndham Health Care offers our patients a variety of services and facilities to assist with their medical treatment. We strive to provide optimum treatment for all patients in a traditional family manner and place great importance on health promotion and disease prevention. 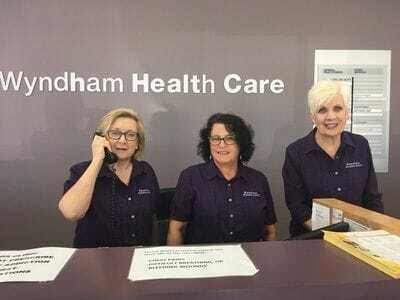 Wyndham Health Care is a large purpose built general practice located in Werribee in a very busy shopping precinct. A number of Allied Health staff support our doctors in treatment of patients as well as nursing staff. FOR ALL AFTER HOURS CONSULT OVER THE PHONE - PLEASE CALL 0432 042 738. Flu vaccine 2019: Do you need it and when should you get it? The annual flu vaccine will soon roll out across general practices, pharmacies, community health clinics and some workplaces and schools. In some pharmacies, the flu vaccine is already on offer. But the Australian Medical Association (AMA) has urged people to hold off on getting this year's vaccine, warning some pharmacies are offering vaccinations too early. "We are concerned when pharmacies are out there advertising early flu shots at a time that might not be clinically appropriate". "People who are vaccinated too early in autumn might have lost protection by late in the spring when the virus has mutated." So, when is the right time to get your flu shot? And is it necessary for everyone? "Every year thousands of Australians are dying or being admitted to hospital for complications of the flu. That is entirely avoidable if people have their flu vaccination". People aged six months and over with medical conditions that mean they have a higher risk of getting serious disease (such as diabetes, severe asthma, lung or heart disease).